Journalist and fitness enthusiast Christopher McDougall once said, “We’re designed for persistence hunting, which is a mix of running and walking. What’s built into that kind of running is a sense of pleasure. You are designed and built and perfect for this activity, and it should be enjoyable and fun.” For those who enjoy the thrill of the hunt during game season, it’s easy to forget that hunting takes more than enthusiasm throughout the rest of the year. And though we may be built for “that kind of running,” some of us could use a tuneup. Peak performance means being at the top of your game. 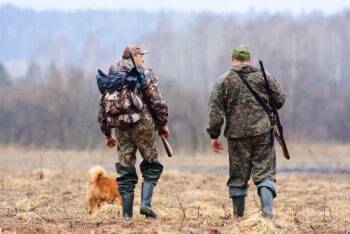 Luckily, there are many resources available to hunters to improve your craft year-round. To better improve your hunting game, you must first improve your level of physical fitness. Hunting takes endurance, agility and the fastest of reflexes. There are entire programs dedicated to optimizing the physical performance required for hunting. Train to Hunt hosts annual events in places like Arizona, Colorado and Washington that are designed around mountain fitness and survival. These workouts focus on your legs, shoulders and lungs while you hike and backpack the terrain to build your stamina and endurance. There are also workout regimes that you can do from home to work out those muscles specific to hunting. Step-ups, planks and dead lifts are among the recommended exercises that prepare you to take on the challenges of hunting terrain. The kind of training you should pursue to better your shot depends on your firearm or bow. For the rifle hunter, organizations like the Peacemaker National Training Center in West Virginia offer unique rifle courses engineered by experienced marksmen to improve your shooter skills and help you understand how to consistently make those longer shots. Different education and training is required for the bow hunter. Some hunter safety courses can be completed online, and other courses focus the bowman’s efforts on form and accuracy. Manufacturers like Lancaster offer training supplies such as slings and stance monitors to assist you in maintaining your form so you can make those tricky shots. Stations like the Outdoor Channel, the Sportsman Channel and HuntIt TV offer a slew of programming geared toward the outdoorsman. These sporting shows can be used as research and entertainment and are available with Dish and other networks. It’s equally as important to understand the hunting environment, particularly the layout of the land. Explore maps of the area and know the behavior patterns of the game and their peak rut seasons to optimize your chances of coming home with a prize. Hunting is more than a seasonal camping trip. It’s a lifestyle. It takes dedication. To be in optimal hunting shape when the time of year comes around, you have to work on improving your game all year long. Maintaining your level of fitness, training for your specific weapon and selected terrain, as well as doing your research, will result in an improved hunt. The sport of hunting is not for the weak or the faint of heart — but as McDougall points out, you’re designed for this. Like Westerns? Like true stories? Check this out…..
John…good advise for just about anything…thank you for the reminder. Two of the most physically demanding hunts I’ve ever made were for Kodiak bear in Alaska and stag in Scotland. With my grey hairs, I can’t imagine hunting Mongolian Ibex. Both of these hunts would have been better if I’d regularly climbed mountains but alas, I lived in flat Texas. I found going up was easy, it was going down that was hard. The day after my Scottish hunt, I could hardly walk. Good words Cherie.